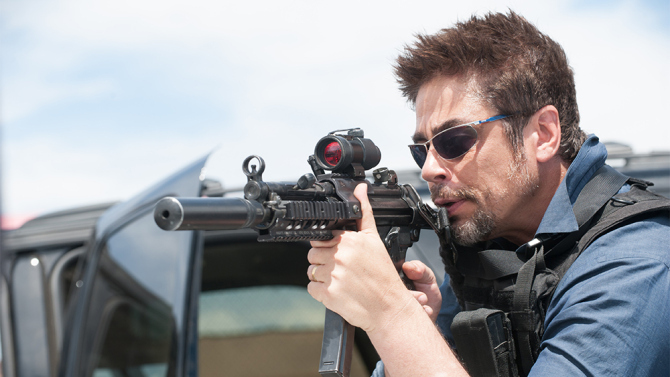 “Sicario” was one of 2015’s best films, a (mostly) South of the Border crime drama which posited that the war on drugs is not only unwinnable but destined to make the U.S. as complicit in evil as the cartels. Also, it starred Emily Blunt (always a welcome thing) as an F.B.I. agent who discovers the hard way that in this conflict there are no good guys. The Blunt-less “Sicario: Day of the Soldado” is a step down from the original (this was pretty much inevitable); nevertheless it works reasonably well as a high-tension crime thriller. Scripted once again by Taylor Sheridan (“Wind River,” “Hell or High Water”) and directed this time around by Stefano Solima (the Italian TV crime drama “Gomorrah”), this entry reunites Josh Brolin and Benicio Del Toro as, respectively, CIA operative Matt Graver and his right-hand man, former cartel hitman Alejandro. This time we don’t have to discover through a principled heroine that our government is willing to do all sorts of unpalatable things to secure our safety. Truth is, just about every character in the film is outright evil or seriously compromised. Early on, Islamic terrorists blow up a big box store in Kansas City; the feds determine that the suicide bombers entered the U.S. as illegal immigrants crossing the Rio Grande, guided by underlings of the Reyes drug cartel. Graver and Alejandro are assigned to start a war among the various cartels through a series of assassinations. They also set in motion a plan to kidnap Isabel Reyes (Isabela Moner), the teen daughter of the Reyes cartel’s leader. Of course this skullduggery is off the books; the government bigwigs who order the mission (Catherine Keener, Matthew Modine) are all about deniability and any member of the team is expendable if it means keeping a lid on things. Writer/director Paul Thomas Anderson has been on such a long, productive run (“Boogie Nights,” “Magnolia,” “There Will Be Blood,” “The Master”) that it was inevitable he’d mess up one day. 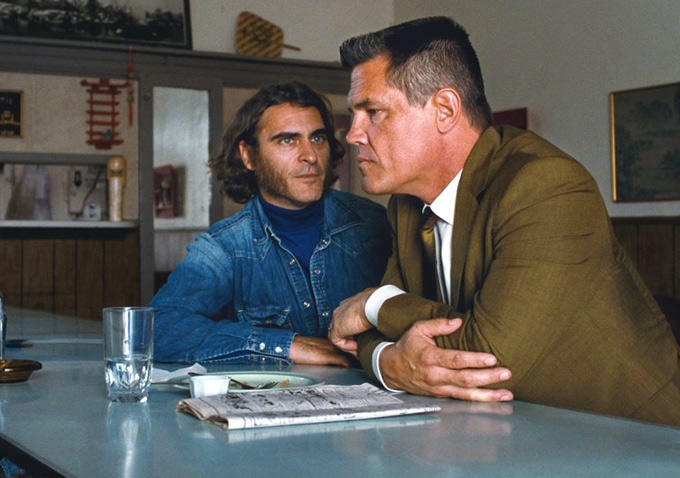 While you can’t categorize “Inherent Vice” as an outright disaster, it spends an awful lot of time going nowhere in particular. Mostly it spreads around lots of stoner whimsey while wasting the efforts of a terrific cast. It’s overlong, underpopulated with anything like real characterizations and — perhaps most frustrating of all — it’s a mystery yarn so uninvolving that 10 minutes after seeing it I could no longer recall who dunnit…or what they done. Critics describe Inherent Vice as the most reader friendly of Thomas Pynchon’s dense, hallucinogenic novels. As compared to what? A trigonometry textbook? It’s a riff on the classic L.A. detective yarn, set in the late 1960s and offering as our private eye protagonist a ganja-addled, sandal-wearing doofus. “Doc” Sportello (Joaquin Phoenix, sleepy-eyed and moving at half speed) is a beach-dwelling sleuth with offices in a free health clinic. He’s visited one night by his former girlfriend, Shasta (Katherine Waterston), a one-time flower-power love bunny who is now the mistress of the ruthless Wolfmann (Eric Roberts), L.A.’s most celebrated real estate developer. Shasta tearfully asks Doc’s help in stopping a conspiracy by Wolfmann’s wife and her lover to have him committed to a mental institution. Doc — who for all his pharmaceutical excesses works to maintain his integrity — assents for old time’s sake. But then both Wolfmann and Shasta go missing, and Doc finds himself dealing with coke-snorting dentist Rudy Blatnoyd (Martin Short), killer Adrian Prussia (Peter McRobbie), and a sax-playing junkie (Owen Wilson) who was declared dead but is now back among the living. Not to mention the Golden Fang, a vast drug-smuggling cartel.